who has a priority first when 2 cards has"at the beginning of your up keep"
Ooh, likewise with protection Lightning Greaves and Swiftfoot Boots are another two staples for commander protection. Another devious ploy I have is if someone is running a mono color deck, for some reason, you can run Illusionary Terrain or Reality Twist . 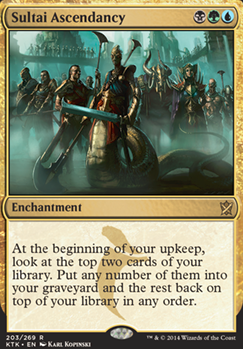 In fact, cumulative upkeep cards are typically good in Muldrotha decks, since you can always recur them if the upkeep gets too high and just play them out of the graveyard. Mystic Remora . Or just a Rhystic Study . Tormod's Crypt is some nice 0 mana recur-able graveyard hate, if needed in your playgroup. I have also had a good time with Sultai Ascendancy , and other draw filters. Eternal Witness is another great card to bring back instants and sorceries. Another overperformer is Unbridled Growth , which not only helps with mana filtering, but is a consistent pay one draw one ever turn. Having general protection stuff is good too: Propaganda . Imprisoned in the Moon and Song of the Dryads can permanently lock out some commanders, and unless they can kill them in response, they don't even get to go back to the command zone unless they have enchantment or land removal (good luck red). Here might be some cards that might help. Plaguecrafter, River Kelpie, Disciple of Bolas, Satyr Wayfinder, Attunement, Sultai Ascendancy, The Eldest Reborn, World Shaper, Commander's Sphere, Reclamation Sage, Viscera Seer, Notion Thief, Spore Frog, Pernicious Deed, Animate Dead, Mystic Remora, Hesitation. In a Muldrotha value based deck, I would advise to go for less Instants/Sorceries and more permanent based spells. Since you will be able to reuse all the different types in the graveyard anyway, you will definitely outvalue your opponents and whiff less. I recommend more self-mill. With Muldrotha, your graveyard is your hand. 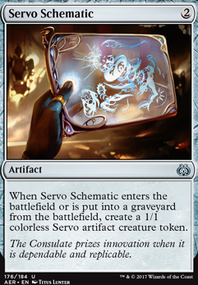 You don't necessarily need dedicated self-mill like Mesmeric Orb, just incidental stuff (the Satyr Wayfinder and Underrealm Lich are a good start, consider adding See the Unwritten, Grim Flayer, and Sultai Ascendancy). Good! What good ideas for my muldrota deck! And what about a alternative to Contamination for winning condition...? Possessed Portal! With the muldrota and with cards that feed the cemetery you continue to play your game keeping the opponents to die slowly in all the turns without anything to do, just sacrifice or discard!!! Taigam, Sidisi's Hand Underrealm Lich Liliana, Death's Majesty Sultai Ascendancy Perpetual Timepiece Are just a few examples of how the possessed portal will not hurt you! An excellent winning condition for the muldromate! Thanks for the ideas! Removal/Interaction: Toxic Deluge is an amazing board wipe in EDH, almost unquestionably better than Damnation here (you can tailor it to miss your commander, too!). Beast Within is one of the best removal spells in the format, along with Nature's Claim and Assassin's Trophy: I'd try and include all three. Maybe might run a few counterspells such as Swan Song/Counterspell/Muddle the Mixture, but that's more of a taste thing: do you want your deck to be more slow and grindy and controlling, or more aggressive where it primarily uses its removal to deal with specific problems? You could also add Lightning Greaves, which is an amazing way to give protection and haste to your commander. 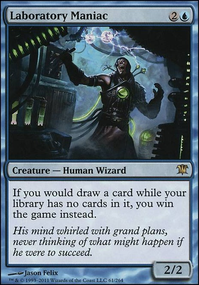 Other good methods of self-mill: The new set gave us various Surveil cards (particularly Doom Whisperer, run him, he's awesome). Beyond that, Mesmeric Orb (hey, convenient that you have one! ), Underrealm Lich, Sidisi, Brood Tyrant, maybe Fraying Sanity? I'd check out the Sidisi list I texted to you, it has some good ones. I'd also use Glimpse the Unthinkable here, probably. 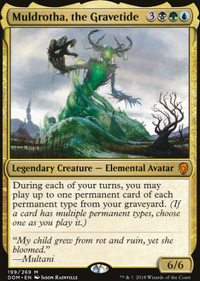 Other great reanimation spells: Exhume, Dance of the Dead, Dread Return, Victimize. Your deck isn't a token deck, so Whisper, Blood Liturgist isn't amazing here, but Hell's Caretaker might do the trick. Final Parting is a MUST, given that you can tutor Jin-Gitaxias, Core Augur into GY and Reanimate/Animate Dead into hand. Landbase tuning: For what it's worth, there's a strong argument for running ZERO basics here (despite increased vulnerability to Blood Moon/Back to Basics/Ruination) for the instant mill combo with Hermit Druid. But if you're gonna do that, or even if you're not, you want less lands that will enter the battlefield tapped (and/or to include Amulet of Vigor). Beyond that, Songs of the Damned is an AWESOME card in this deck, and Ramunap Excavator is silly here obviously. I'd also play the five allied fetchlands (Wooded Foothills, Polluted Delta, Windswept Heath, Flooded Strand, and Bloodstained Mire) and the three appropriate shocklands (Breeding Pool, Watery Grave, and Overgrown Tomb). In a 3-color deck, I'd remove most utility lands (excluding Rogue's Passage and Cephalid Coliseum, maybe one or two more), and primarily work on fixing your colors and having lands come in untapped. The other major lands I'd say you're missing are City of Brass, Reflecting Pool, and Urborg, Tomb of Yawgmoth. You can probably cut down to 36 lands, which can open a slot or two. I'd say that the most natural cuts would be Fleet Swallower, Ghoultree, It That Betrays, Laboratory Maniac, Master Biomancer, Reyhan, Last of the Abzan, Taigam, Sidisi's Hand, Vorinclex, Voice of Hunger, Chill of Foreboding, Damnation, Sultai Ascendancy, and two lands. After that point, cutting gets hard. ok, Sultai Ascendancy is out (getting the 3 right colors turn 3 was a crapshot anyway). Training Grounds is def out, it really wouldn't feel good at all, its prob only worth running with a commander than can utilize it. The Jace, Vryn's Prodigy Flip has actually been really good for me at least, it allows you to recast some pretty strong spells, potentially twice. I used to have a Archfiend of Depravity but it does nothing vs the people I play vs, they either play mass wipes or just dotn swarm the board. The people who play tokens, Necroplasm is better for that since he digs himself out of graveyard by himself. The new lich is replacing the Taigam. I'm gonna have to think about your other suggestions overtime, if you have anymore, please go ahead, much appreciated! Also the beacon wouldn't work, need a card to stop decking myself liek Vigor or a titan, one that doesnt reshuffle the whole graveyard back. Training Grounds is def out, it really wouldn't feel good at all, its prob only worth running with a commander than can utilize it. The Jace, Vryn's Prodigy Flip has actually been really good for me at least, it allows you to recast some pretty strong spells, potentially twice. I used to have a Archfiend of Depravity but it does nothing vs the people I play vs, they either play mass wipes or just dont swarm the board. The people who play tokens, Necroplasm is better for that since he digs himself out of graveyard by himself. I'm gonna have to think about your other suggestions some more, if you have anymore, please go ahead, much appreciated! Also the beacon wouldn't work, need a card to stop decking myself like Vigor or a titan, one that doesnt reshuffle the whole graveyard back. Grimgrin, Corpse-Born and Cryptbreaker have good synergy. Grimgrin is a beater, affects the board with specific removal, is a sacrifice engine, and goes well with Necrotic Ooze/Phenax, and like Cryptbreaker (gotta love them one drops) it goes well with this commander and her expendable zombies. Sultai Ascendancy is a rather weak card, it's a 3 drop with no immediate effect, only digs two cards deep, only mills one card and at upkeep, and is one less creature to be made a 2/2 zombie from Sidisi. Jace, Vryn's Prodigy Flip isn't the best, he flips too quickly, his ultimate mills your opponent's not you, unlike Eternal Witness it can only recur instant/sorceries then exiles them. Thrashing Brontodon is a good piece of removal but you could upgrade with Reclamation Sage/Caustic Caterpillar/Assassin's Trophy. Vizier of Many Faces is alright, I thought I should mention Clever Impersonator/Phyrexian Metamorph/Evil Twin. Maybe Drana instead of Taigam? Venser, Shaper Savant/Royal Assassin/Archfiend of Depravity v Dream Eater? Just stuff to consider. Training Grounds is a wasted slot, it works with a handful of cards and synergy is good but always assume the worst case scenario, and ask if you would really target this card with Skullwinder. I think you've made a fine deck otherwise. And to answer your question about a card that shuffles back alone, would Beacon of Unrest suffice?